I've only ever had good experiences with H&H! They are so efficient, always reply to emails very quickly and are so helpful! They provide excellent, friendly service and I would definitely recommend them! So pleased to have used H&H for my minibus hire, they were quick and efficient, the minibus was in good condition and the staff were friendly. Significantly better than other minibus hires which are possible in the area and really convenient to get to from North London, being a small walk from Kentish Town tube. Only complaint was that the minibus arrived nearly empty and I returned it at 1/3 full, as I had no idea what mileage I would get from it hence filled it up completely - far prefer a full-to-full service. H and H are our go-to supplier for all our transport needs. Competitively priced, always excellent quality of vehicle and always willing to go the extra mile. It is always an absolute pleasure dealing with the team here. Highly Recommend! Fantastic service and staff! Very easy to organise hire, pick up and drop off. Unfortunately I dented the van and they were very sympathetic and easy to deal with! I just paid my £200 excess and they were happy. What a "vantastic" company, I keep coming back whenever I need to rent a van and also send all my friends and colleges here . Steve runs a tight ship good clean reliable vans and brilliant helpful staff. The one time one i did have a problem the office was all over it and get everything resolved for me , they offer coffee and pastries in the office to help get you going in the morning and also great value prices ..
Been going there for years. Top class customer service. The vans are always clean. Would recommend them anyday. Great service - quick pick up, even though I changed size last minute. Clean & new vehicle. Easy drop off. Having never driven a van or driven in London, I was canny nervous about renting a van to move house. Excellent customer service and reassuring staff made the process a lot smoother. Would recommend to anyone who needs any size van in London. Prices were reasonable and best of all - quiet location for picking up and dropping off the vehicles. You can do it out-of-hours too with a key drop box which makes life a lot easier. The most honest rates I have found in London, and outstandingly understanding when it came to last-minute changes of plan on a busy moving day. I don't expect to come across a more obliging and courteous rental company. H&H are the most obliging hire company have come across, always willing to help and go the extra mile. This is a great family business with the added personal touch. We use H&H regularly. Great service - friendly, professional and good quality vehicles. You made my home move so easy, thank you. No need to look any further for a great van, a friendly and understanding staff, and really good rates. They also do 24h return which is always so convenient. Truly the best van hire company around London in my opinion! Excellent!!!! Very friendly staff, very reasonable price and clean vans. I really can't fault my experience with H&H and I would definitely highly recommend it! I cannot recommend this company enough. A very slick and professionally run establishment that catered for my last minute request for a Luton van. There was no waiting upon pick up and all admin was completed very promptly. I drove away some 15 minutes after walking in. A nice touch was also to find out that the van was on automatic payment for the Dartford Toll. The van was immaculately kept and all the minor damage was pointed out and recorded before I signed it off. I completed an approximate round trip of 600 miles with the van easily maintaining good speed despite the full laden weight it was carrying. I will definitely look to use H & H again when in need of a van. I find the staff cannot do enough for you. I had the pleasure of having a long term hire last year and I found the service excellent, nothing was too much trouble. I would certainly recommend to other people. Really great service! Helpful on the phone, did my license checks in advance so checking in took moments and the staff were helpful on showing how to operate the van. Pricing very competitive for the area (better than any others I've seen). Made good use of an app to record any existing damage and emailed me my invoice on the spot. Really excellent all around! So quick, easy and the staff are very friendly and knowledgeable. As someone who had never drove a van, they made my experience much more relaxed and comfortable. Pick up and drop off all stress free. Will definitely use again when I need a van. Very good vehicle rental company. Less hassle and easy transaction. No hidden charges and anytime drop off option mean you don’t need to panick. Simply the best Hire Van Company in London..! Ive been hiring vans from this company for over 13 years and the service is excellent. I would recommend them to everyone, not too many tho because i need a van myself. I work in the film industry. We are always on the lookout for vehicle hire companies who can cater for our specialist needs at attractive prices. Working with H&H has been an absolute pleasure. The process is simple and very professional at every step, including when adding additional drivers to a vehicle, which can be a painful experience with other companies. The customer service is great, the company is very responsive and reliable. The vehicles are in perfect condition. Great value for money, takes the headache out of sourcing and managing a fleet. Superb experience. They had a van available at short notice, for a very good price and were helpful and efficient when I collected. The drop off couldn't have been more simple or flexible. I would definitely use them again and highly recommend them. Right, where do i start.....Booked a van and was called back soon after to confirm details and make payment. Arrived in the morn and was shown the van and emailed the damage report there and then!, was then given the keys and let loose on the streets!Van was clean and tidy (had been washed), worked as it should.Returned the van on Sunday night and put the keys in the safe deposit box. But forgot my House Keys in the van!!! !First thing the following morning I went back and spoke to a gent on the desk who immediately checked to see if the van was still there, which it was (phew!). One of his colleagues opened the van for me and I found my keys in the drivers door pocket - Note people..... Double and triple check before you give the keys back!.The service i received was brilliant from initial call. I would without doubt recommend these guys to anyone in the London area and will be using their services again in the future.Great work guys! and Thanks again. I think I felt a something strange because I don't have the English accent. There was a judgemental process going on that I could pick up from thin air. It is absolutely very subtle, nevertheless, nothing to affect the process of renting and the experience of having and using the car. But somehow it stays with me as I am thinking about the overall deal. Otherwise everything was smooth.Thanks. I guess I would use again. Brilliant little, independent vehicle hire company.Very friendly and helpful people.Decent quality vehicles too.And you don't get ripped off for hiring from them either (i.e. no ludicrous add-on insurance/extras costs etc).Will always hire from these from now on. 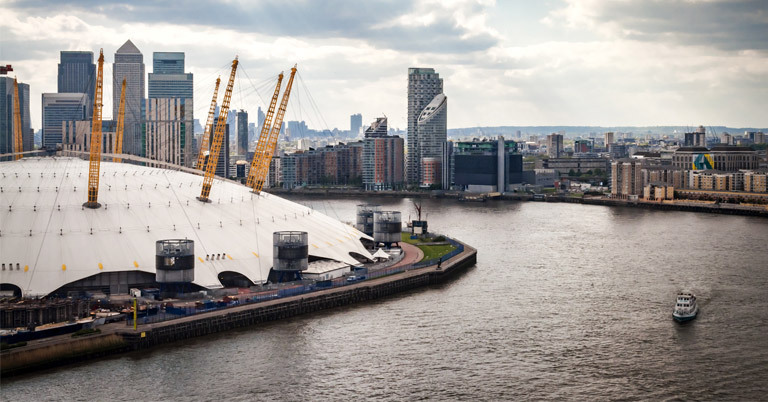 The O2 Arena in London is one of the biggest live entertainment venues in the world, accommodating 20,000 people and welcoming more than two million visitors every year. Built at a cost of more than £800 million to mark the UK’s millennium celebrations, it houses a spectacular year-long exhibition that began on 1st January 2000. Initially called the Millennium Dome, the white building designed by architect Richard Rogers features one of the largest domes in the world and is a spectacular landmark on the capital’s skyline. The building was planned by John Major’s Conservative government as a World Fair-type showcase to mark the third millennium. Funding was largely provided by the National Lottery. Construction work started in 1997, taking three years to complete. The exterior of the building features a large, white dome, with 12 yellow towers on top, each one standing 100 metres high. The 12 towers represent each month of the year, while the building’s diameter of 365 metres represents the number of days in a year. Once the successful millennium exhibition had finished, the Greenwich building’s future was the subject of much debate and controversy. The millennium exhibition was never going to be permanent, and due to the huge cost of building the Millennium Dome, a more permanent use was sought for the premises. Press reports claimed its maintenance costs were £1 million a month, even when empty. Apart from the commendable efforts that turned it into a temporary shelter for homeless people over Christmas in 2003, the Millennium Dome began to look like a “white elephant”. However, all of this changed in 2007, when Meridian Delta Ltd transformed it into the O2 Arena, sponsored by the telecommunications giant. Ever since, it has hosted live gigs by some of the world’s major superstars including Ed Sheeran, Celine Dion, Bon Jovi, Take That, Rod Stewart, Rihanna, Jay Z, Justin Bieber, Noel Gallagher and Prince. In total, around 600 artists have played at the O2 Arena. The fastest-selling gig was the reunion concert by the Spice Girls in 2007, which had completely sold out in just 38 seconds! The venue was even used as a filming location for the James Bond movie, The World is Not Enough, in 1999. Starring Pierce Brosnan as British spy 007, scenes from the film were filmed at the Millennium Dome, before it opened to the public. Bond chases a beautiful villain in a speed-boat along the River Thames, but she tries to escape in a hot air balloon. Bond ends up on top of the O2, trying to grab the ropes of the balloon, but he loses his grip and falls on to the roof of the arena in the thrilling opening sequence. This year, a number of top artists and events are lined up for the O2. The Brit Awards 2019 will be staged there on 20th February, hosted by Jack Whitehall for the second consecutive year. Nicki Minaj will be playing live on 11th March, as part of her world tour. She will be showcasing her platinum-selling album, Queen, promising fans a “fully immersive experience”. The tour also features Chicago rapper Juice Wrld. Take That have announced eight dates at the O2, starting on 2nd May, to celebrate their 30th-anniversary tour. They will be joined by pop superstar Rick Astley. Olly Murs’ All the Hits Tour is stopping off at the O2 on 17th and 18th May. Now a host on TV talent show The Voice, he is the X-Factor’s most successful male artist, with more than 17.5 million followers on social media. Rita Ora will be appearing on 24th May, followed by crooner Michael Bublé from 30th May to 1st June. Boy band Westlife are playing live from 13th to 15th June, celebrating their 20th anniversary with The Twenty Tour. Backstreet’s back alright! Yes, the Backstreet Boys’ DNA World Tour on 17th and 18th June showcases their new album. Ariana Grande will be appearing from 17th to 20th August, followed by Cher on 20th and 21st October. Veteran rocker Rod Stewart ends his 2019 tour with two massive nights at the O2 on 17th December and 19th December. The tour will be filled with both classic hits and the latest songs from his new album, Blood Red Roses. Stewart is one of the best-selling artists of all time, having sold more than 200 million records across the world. Legendary singer Elton John is kicking off his Farewell Yellow Brick Road tour at the O2 on 4th November and has a further four shows lined up, before he embarks on the colossal world tour throughout 2020 and 2021. It will be taking in many places where the superstar has played during the past 50 years and will consist of 300 shows across five continents. He says the UK dates will be “emotional” and “a lot of fun”, marking what he says will be his last ever live tour. If you’re planning to watch your favourite stars playing at the O2, hiring a minibus from H&H Van Hire is an ideal way for groups of people to travel. Enjoy the build up to the gig and arrive together in comfort. A minibus will also cut out the hassle and expense of taking several individual cars. Our minibuses provide a cost-effective travel solution when you divide the hire fee between you. Please contact us for further details of our comfortable nine, 14 and 17-seater minibuses.